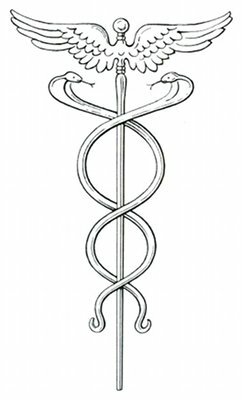 Two types of caduceus are given here. 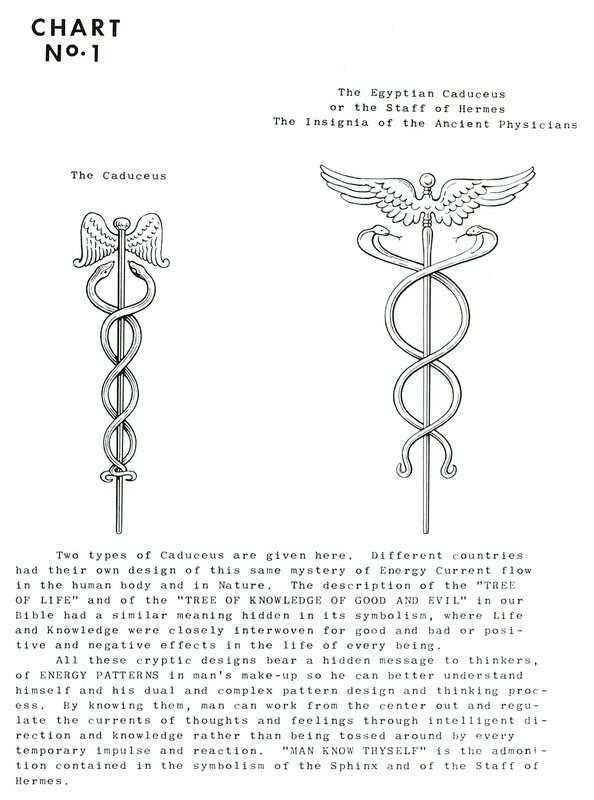 Different countries had their own design of this same mystery of energy current flow in the human body and in Nature. The description of the "Tree of Life" and of the "Tree of Knowledge of Good and Evil" in our Bible had a similar meaning hidden in its symbolism, where Life and Knowledge were closely interwoven for good and bad or positive and negative effects in the life of every being. 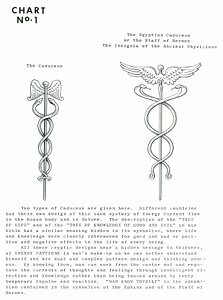 All these cryptic designs bear a hidden message to thinkers, of energy patterns in man's make-up so he can better understand himself and his dual and complex pattern design and thinking process. By knowing them, man can work from the center out and regulate the currents of thoughts and feelings through intelligent direction and knowledge rather than being tossed around by every temporary impulse and reaction. "Man know thyself" is the admonition contained in the symbolism of the Sphinx and of the Staff of Hermes. Book 1, "Explanation of Chart No. 1"